www.postmagazine.com 24 POST JANUARY 2018 VFX FOR SPOTS VFX FOR SPOTS MPC GETS DOWN TO BUSINESS STUDIO'S VFX TALENTS BOOST TOP SPOTS PC Advertising had an impres- sive 2017. With offices in London, New York, Vancouver, Bangalore, Amsterdam, Montreal and more, the studio completed memorable work on a storm of spots for such leading brands as Samsung, Microsoft, Fiat, German supermarket Edeka, Volkswagen, Heineken and Honda. 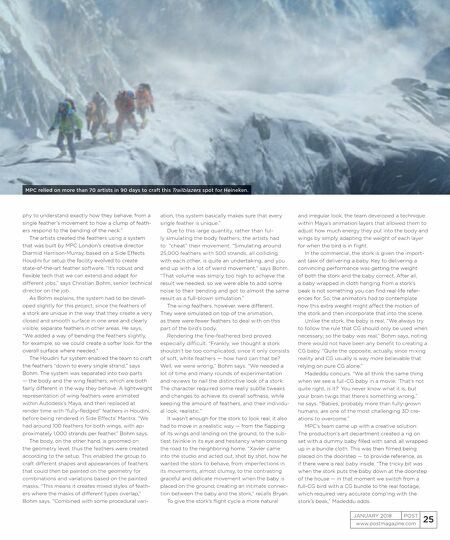 Providing a range of in-house creative and production solu- tions including concept design, previz, shoot su- pervision, 2D compositing, 3D/CG effects, anima- tion, motion design, software development, mixed reality and experiential production, live action production and color grading, the studio talks here with Post about several of its stand-out projects over the last year. THE STORK In an attempt to answer the "uncomfortable" ques- tion that young children often ask their parents — Where do babies come from? — adults often abandon the truthful explanation for the age-old pro-creation myth that is more on a level with a youngster's comprehension: Storks deliver them. In Leo Burnett's live-action commercial for Fiat titled, The Stork, one of these large birds lands on a family's doorstep with a small bundle of joy, but upon seeing a Fiat parked in a driveway across the street, the stork instead delivers the precious cargo to the Fiat home. "It was clear from the beginning that the star of the whole commercial, from a storytelling point of view, was the stork. This ad only works if people believe what they were seeing," says Martino Madeddu, 3D visual effects supervisor at MPC, the creative studio behind the stork character. "That is what Xavier pushed for at every stage of the production." Madeddu is referring to Xavier Mairesse at Mercurio Cinematografica, who directed the com- mercial. 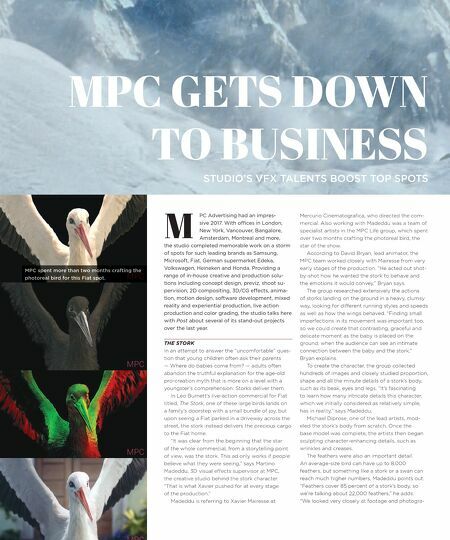 Also working with Madeddu was a team of specialist artists in the MPC Life group, which spent over two months crafting the photoreal bird, the star of the show. According to David Bryan, lead animator, the MPC team worked closely with Mairesse from very early stages of the production. "He acted out shot- by-shot how he wanted the stork to behave and the emotions it would convey," Bryan says. The group researched extensively the actions of storks landing on the ground in a heavy, clumsy way, looking for different running styles and speeds as well as how the wings behaved. "Finding small imperfections in its movement was important too, so we could create that contrasting, graceful and delicate moment as the baby is placed on the ground, when the audience can see an intimate connection between the baby and the stork," Bryan explains. To create the character, the group collected hundreds of images and closely studied proportion, shape and all the minute details of a stork's body, such as its beak, eyes and legs. "It's fascinating to learn how many intricate details this character, which we initially considered as relatively simple, has in reality," says Madeddu. Michael Diprose, one of the lead artists, mod- eled the stork's body from scratch. Once the base model was complete, the artists then began sculpting character-enhancing details, such as wrinkles and creases. The feathers were also an important detail. An average-size bird can have up to 8,000 feathers, but something like a stork or a swan can reach much higher numbers, Madeddu points out. "Feathers cover 85 percent of a stork's body, so we're talking about 22,000 feathers," he adds. "We looked very closely at footage and photogra- M MPC spent more than two months crafting the photoreal bird for this Fiat spot.